With the dramatic Atlantic coast as its backdrop, this is a real treasure awaiting your discovery. Don’t miss this treat as you travel along the Wild Atlantic Way. Combining the best of Irish crafts, gifts, clothing and textiles, all with a view across a magnificently rugged coastline and rolling hills, Avoca Letterfrack is a must-see for the Connemara visitor. Our mill in Avoca village was originally set up as co-operative in 1723. Here, local farmers could grind their corn, and spin and weave their wool for clothing for the local miners. 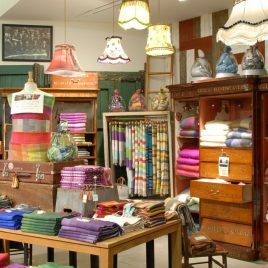 Now heralded as one of Ireland’s most exciting retail stores, there are Avoca ceramics, clothing, perfumes, soaps and more from our own design studio. And all of this from a modest hand weaving mill, established in a rural Irish village in 1723.